As bank and financial institutions (BFIs) are pressing the investors to meet margin calls, the stock market is in free fall. Following the drop in stock prices in recent weeks, BFIs are urging borrowers to deposit either cash or additional stocks to cover the losses. With Sunday's fall in Nepse index, Rs 48.19 billion has been wiped out from the stock market. The rush of investors to offload their stocks to repay loans has sent the market down last year's level. The benchmark index, which was at 1,251.42 points on February 4 last year, rose to a record 1,881.45 points on July 27 last year before entering into a correction mode. Excess liquidity in the banking system, which was a major driver of the bullish run, started disappearing due to mismatch between deposit and loan growth of BFIs since the first quarter end of the current fiscal year. 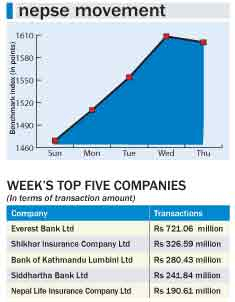 “The stock prices started retreating due to shortage of investable fund in the banking system, prompting margin calls,” Sandeep Bikram Rana, a stock market analyst, told Republica. “Most of the borrowers, who had invested in the stocks from the money they had borrowed, are now compelled to offload their holding in the wake of margin calls,” added Rana, who is also a co-founder of IMS Investment Management Services Pvt Ltd that provides information, portfolio tracker and in-depth analysis of stock market. With interest rates on the rise, many investors, who have been investing their savings in the bullish stocks, are also diverting their funds toward bank deposits. “The average return of stock market is at around 15 percent. So, investors, particularly institutional investors, are seeing investment on fixed deposits of as high as 13 percent more rational than the risky stock market,” said Rana. According to stock brokers, investors, who have borrowed from BFIs as well as small investors, are in the frontline of placing sell orders in the bear market. “It seems that many investors, who borrowed from banks while rates were low, are feeling pressure to sell their stocks due to margin calls. There are also small investors who are panicked by the fall in the stock prices. They want to be on a safe side by exiting the market now,” Priya Raj Regmi, the president of Stock Brokers Association of Nepal, said. Though the stock market took a dive on Sunday, five listed companies observed their share prices go up on Sunday. Share prices of Mero Microfinance Bittiya Sanstha, Guheshwori Merchant Bank and Finance Ltd, Soaltee Hotel Ltd, Jebils Finance Ltd and Prabhu Bank Ltd (Promoter) went up on Sunday, while all other companies fell in the red zone. Except Hotels group, whose saw its sub-index rise by 15.4 points, all trading groups logged loss on Sunday. The Insurance sub-index went down by the highest 346.14 points to close at 5,034.73 points. A total of 1.31 million units of shares of 132 companies worth Rs 494.11 million were traded in the market on Sunday through 6,158 transactions. Analysts also forecast that the stocks are likely to fall further as the 'credit crunch' rattles the BFIs due to mismatch in their deposit and loan growth.